Not much to highlight this week from area players in the pro ranks other than Bobby Convey’s assist in Toronto’s 1-1 draw with Chicago in last Wednesday’s midweek match up. 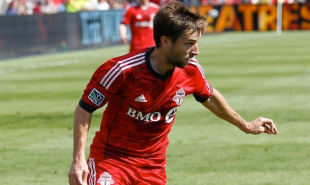 Bobby Convey, M, Toronto FC — Started and played 90 minutes in Wednesday’s 1-1 draw with Chicago, providing an assist in the 23rd minute. Started and played 90 minutes in Saturday’s 2-0 loss at New York. Season: 20 games, 18 starts, 1 goal, 4 assists. Ryan Finley, F, Columbus Crew — In the 18, but did not play. Season: 10 games, 3 starts, 1 goal, 1 assist. U.S. Open Cup: 0 games. Antoine Hoppenot, F, Philadelphia Union — Played 11 minutes in Saturday’s 1-0 loss to Houston. Season: 26 games, 1 start, 3 goals, 1 assist. U.S. Open Cup: 1 game. Jeff Larentowicz, M, Chicago Fire — Started and played 90 minutes in Wednesday’s 1-1 draw at Toronto. Started an played 90 minutes in Saturday’s 3-2 win over New England. Season: 27 games, 26 starts, 1 goal, 4 assists. U.S. Open Cup: 3 games, 1 start. Jeff Parke, D, Philadelphia Union — Started and played 90 minutes in Saturday’s 1-0 loss to Houston. Season: 26 games, 26 starts, 7 clean sheets. U.S. Open Cup: 2 games, 2 starts. Andrew Wenger, F, Montreal Impact — In the 18, but did not play. Season: 15 games, 6 starts, 1 goal, 3 assists. Canadian Championship: 4 games, 4 starts, 1 goal. Greg Cochrane, D, Los Angeles Galaxy — Next game scheduled for September 18, 2013. Tournament: 0 games. Dan Gargan, D, San Jose Earthquakes — Next game scheduled for September 17, 2013. Tournament: 2 games, 2 starts, 0 clean sheets. Marcus Tracy, F, San Jose Earthquakes — Next game scheduled for September 17, 2013. Tournament: 0 games. Andrew Wenger, F, Montreal Impact — Next game scheduled for September 17, 2013. Tournament: 1 game. Hunter Gorskie, D, New York Cosmos – Started and played 90 minutes in Saturday’s 1-0 win over Minnesota. Season: 6 games, 6 starts, 2 clean sheets. Pat Hannigan, GK, San Antonio Scorpions — Started and played 90 minutes in Saturday’s 2-1 loss at Atlanta. Season: 12 games, 12 starts, 21 goals against. U.S. Open Cup: 0 games. Corey Hertzog, F, FC Edmonton — On loan from Vancouver, started and played 81 minutes in Sunday’s 1-1 draw with Fort Lauderdale. Season (Edmonton): 6 games, 6 starts, 2 goals. Season (Vancouver): 7 games, 6 starts, 1 goal, 1 assist. Canadian Championship (Vancouver): 2 games, 1 goal. Jon Okafor, M, MYPA — Started and played 64 minutes in Thursday’s 1-0 win over FF Jaro. Played 45 minutes in Monday’s 3-2 loss at IFK Mariehamn. Season: 26 games, 14 starts, 2 goals, 1 assist. Alex DeJohn, D, Ekenäs IF — Started and played 90 minutes in Saturday’s 4-0 win over LPS. Season: 21 games, 21 starts, 11 clean sheets. Russell Canouse, M, Hoffenheim — Started and played 90 minutes in Saturday’s 4-0 win over Wacker Burghausen. Season: 3 games, 3 starts. Zarek Valentin, D, FK Bodø/Glimt — Started and played 90 minutes in Monday’s 2-0 win over HamKam. Season: 20 games, 20 starts, 11 clean sheets. Cup: 3 games, 3 starts, 1 clean sheet. Bobby Warshaw, M, Ängelholms FF — On loan from FC Dallas, in the 18, but did not play. Season (Ängelholms FF): 2 games, 2 starts, 1 goal. Cup (Ängelholms FF): 1 game. Season (Dallas): 8 games, 1 start. Anthony Allison, F, Umeå FC — In the 18, but did not play. Season: 16 games, 12 starts, 2 goals, 1 assist.